Today, I am going to review Brooke Bond's "Taj Mahal Tea". I started drinking tea just a few years back and I only take one or two cups of tea in a day. However, I always want that the tea I am drinking must be of a high quality and with a nice flavor. The association of Taj Mahal Tea with my family is very old and it is one of the favorite brands of my father till he shifted to Brooke bond natural care tea. Everyone who takes tea know that some of tea brands available in the market don't work well or their taste is not good. Different people look for different qualities in their tea, some look for strong flavor while some like the mildness. The tea companies pay a lot of money to tea tasters so that they can provide the best quality tea to their customers. Taj Mahal Tea brand came to existence in 1966 and this tea comes from the Tea plantations around the Brahmaputra river (upper Assam). 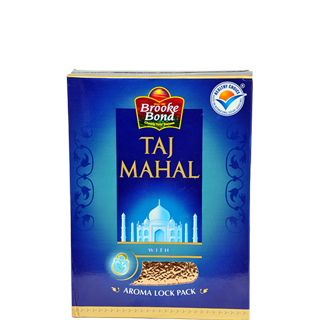 Brooke Bond says that best of tea leaves are used to make the Taj Mahal Tea. This tea becomes a brand in the1980s with the association of Tawala player Zakir Hussain as its brand ambassador. Everyone may have remembrance of old Taj Mahal ads in which Zakir Hussain saying "Wah taj wah taj". In 1987, the company came up Taj Mahal Tea Bags. Today, Taj Mahal Tea a successful tea brand in India and millions of people enjoy this tea daily. Recently, I shifted to Taj Mahal Tea and found its flavor and aroma very nice. When you smell the raw Taj Mahal Tea then it smells like a natural tea, which gives the sign of its purity. In my village too, tea plantation is done so I have some idea about the flavor and aroma of a good tea. Brooke Bond claims that Taj Mahal Tea is made with patented patented TESS™ technology, which insures that we gets the best quality tea. A tea is a good drink full of many antioxidants if it is naturally grown and carefully made. I have liked the Taj Mahal Tea and will like to give it 9 stars out of 10 Taj Mahal Tea.